This is the ear Army surgeons were able to grow in the arm of Pvt. Shamika Burrage. Pvt. Shamika Burrage lost her left ear in a crash. Army surgeons performed a total ear reconstruction, the first of its kind in the Army. Doctors took cartilage from the soldier's ribs, carved out a new ear and placed it under the skin of her forearm to allow it to grow. "It's been a long process for everything, but I'm back," Burrage said. After a soldier lost her left ear in a car crash, Army surgeons were able to grow a new ear in her forearm and transplant it onto her head. The Army announced Monday that the procedure performed on Pvt. Shamika Burrage was successful. The total ear reconstruction, the first of its kind in the Army, was performed at William Beaumont Army Medical Center in El Paso, Texas. Doctors took cartilage from the soldier's ribs, carved out a new ear and placed it under the skin of her forearm to allow it to grow. "The whole goal is, by the time she's done with all this, it looks good, it's sensate and in five years, if somebody doesn't know her, they won't notice," chief plastic surgeon Lt. Col. Owen Johnson III said in a statement. Three years ago, Carly Nguyen didn't know if she would find a bone marrow match as she struggled with leukemia. Asian Americans are underrepresented in the donor registry. On Friday, she met the donor, Gerard Bao, who saved her life. 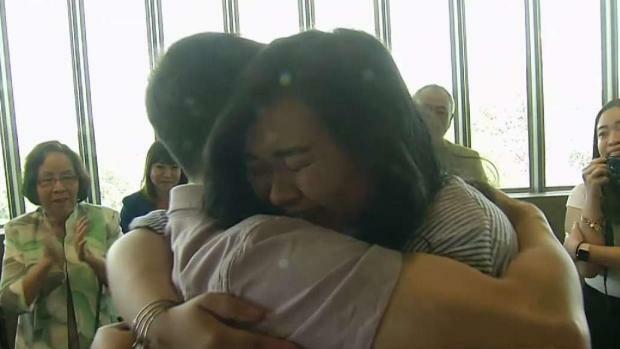 News4's Aimee Cho shows the emotional moment Nguyen got to thank him. Go here to learn how you can become a marrow donor. In 2016, Burrage was driving from Mississippi to Fort Bliss, Texas, with her cousin when a tire blew. The car veered off the road, skidded for 700 feet and then flipped multiple times. Burrage, then 19, was thrown from the car. Her cousin, who was eight months pregnant, suffered only minor injuries. But Burrage suffered head injuries, spinal fractures, road rash and the complete loss of her left ear. After several months of rehabilitation and counseling, she looked into how to get a new ear. Army surgeons told her they could potentially make her a new one. "I was going to go with the prosthetic, to avoid more scarring, but I wanted a real ear," she said in the Army's statement. "I was just scared at first but wanted to see what [the surgeon] could do." Burrage, now 21, has two surgeries remaining. She is a supply clerk with 1st Battalion, 35th Armored Regiment, 2nd Brigade Combat Team, 1st Armored Division. She has hearing in her left ear, and she's feeling optimistic. "It's been a long process for everything, but I'm back," she said.